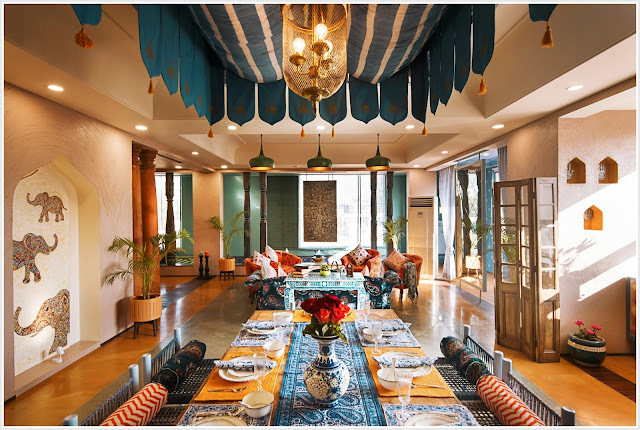 Jaipur based Architecture and Interior Design firm, "VB Design Studio" has garnered a lot of attention lately for their newest project - “Riwaayat” (translating to mean traditions). 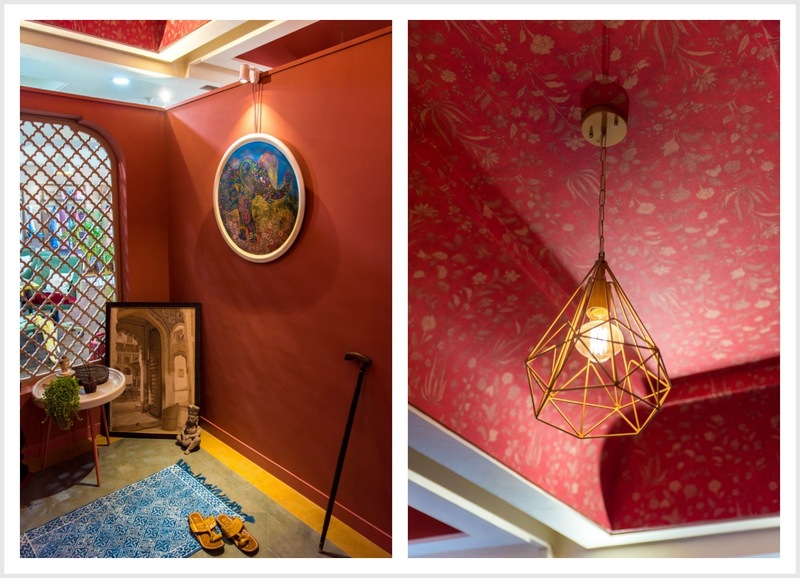 Lead Architect and Founder of VB Design Studio, Vipin Bakiwala (an alumni of MBM Engineering College, Jodhpur) is known to create spaces that are a true reflection of the Inhabitants’ soul. Assisting him in his various projects, is a seasoned design team comprising of young & enthusiastic architects, designers, artists and artisans. VB Design Studio was engaged by Mr. Ankit Chitlangiya (owner of Sapphire Fashions) to bring Project Riwaayat to life. Mr. Ankit Chitlangiya's business involves exporting traditional hand-block printed apparels and accessories [beach wear, tunics, bags, scarves, etc.] to a huge clientele across Europe. 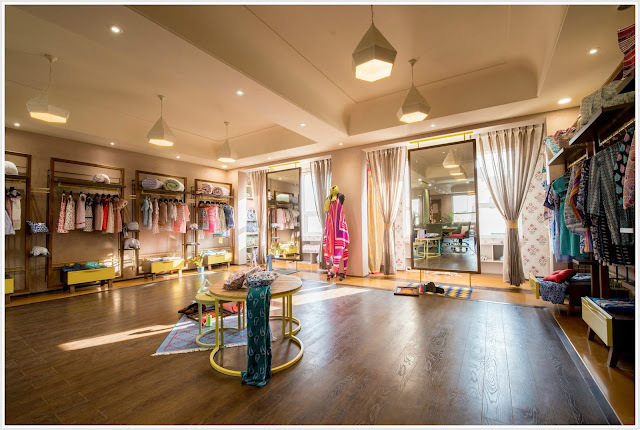 The buyers frequent his factory to discuss business and he was in dire need of a dedicated space to display his creations as well as provide a luxurious shopping and business experience for his clients. He strongly believed that bringing Vipin on board would bring vision, professional flair and a keen sense of style to this project. Without a doubt, Vipin's uncompromising commitment to detail from concept to completion, has created a space that is like none other! Located on the third floor of Mr. Ankit's factory, Project Riwaayat is a 3100 sq. ft. display space that encompasses two entrance lobbies, a sprawling display & discussion area, landscape, water body and four mockup areas- master bedroom, kid’s bedroom, lounge & dining. The project spanned a period of 24 months with VB Design Studio taking on Architecture, Interior Design and Product to create a style and culturally conscious space. From the very outset the team strove to seamlessly integrate the clients’ needs and design expectation with their own expertise in exploring and experimenting with different trends and materials with the objective of creating expressive and timeless designs. 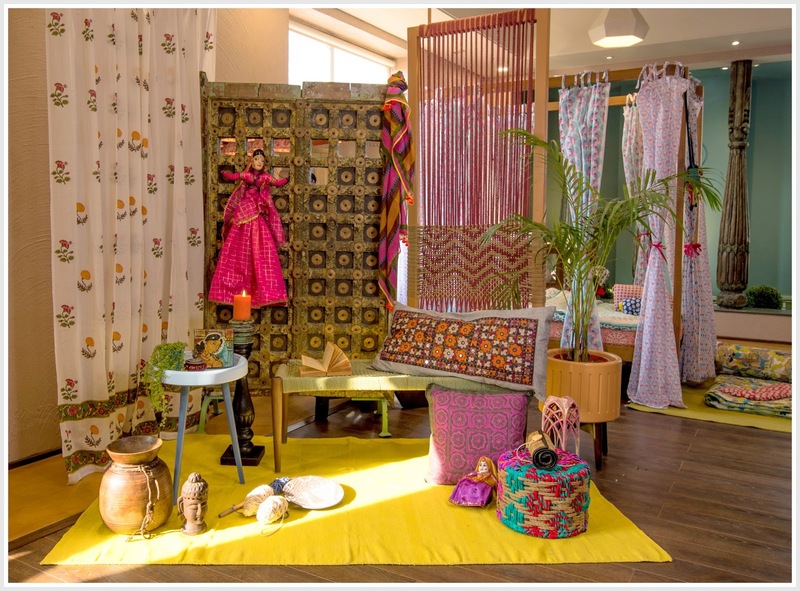 "The design language and vocabulary of the space celebrates the Rajasthani architecture, its many influences (mainly Mughal and Moroccan) and the art of block printing which was materialized authentically in both material and workmanship. 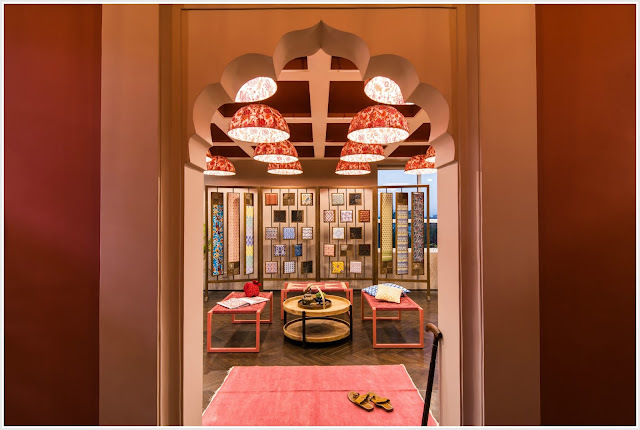 The architectural inspirations expressed on modern lines such as ceilings with gardana, jaali, paan patta plaster moldings, lipai, mehraab (arches), chhatri (domes) and bageecha (mughal garden) give the space its key identity. Traditional portrayal of motifs of flora and fauna, are conspicuous throughout the space in art forms, wallpapers and upholstery. The space carries contemporary expressions of the traditional art & craft techniques- weaving with jute threads on khaat’, swarna patra work (gold leafing), arayesh work and hand crafted blue pottery tiles." Starting off with the entrance to the lobby which is done in shades of sunset pink. 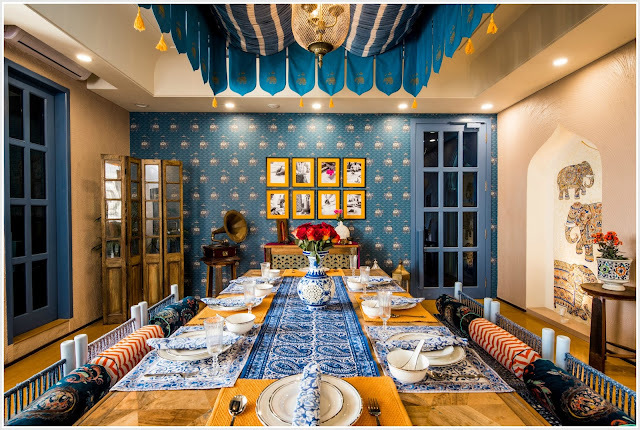 Wall paper from Sabyasachi's collection adorns the ceiling and in-house designed iron lights dot the space along with intricate ‘jaali' partitions that mirror the old Rajasthani havelis. As you can see, there is a strong color play in almost all sections of Riwayaat. What's even more wonderful is that the design team did not stick to the age old adage of carrying a particular color family through out the space to make things cohesive. 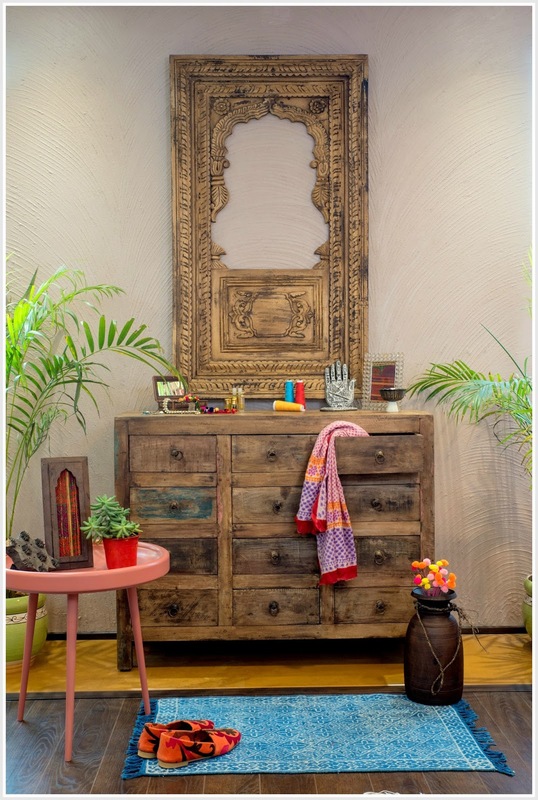 Infact, every room and every work area has been thoughtfully given boundaries via color, pattern and texture play. 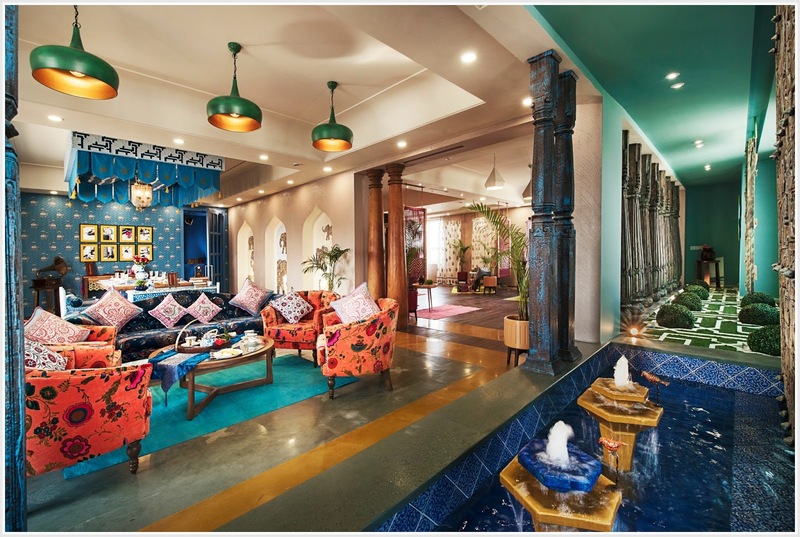 The foyer entrance is imposing and makes for a great first impression with its Mughal inspired cusped arch entrance (also known as the ‘Darwaza'). The ceiling with its sixteen domes representing a ‘Chhatri’ makes for maximum impact. 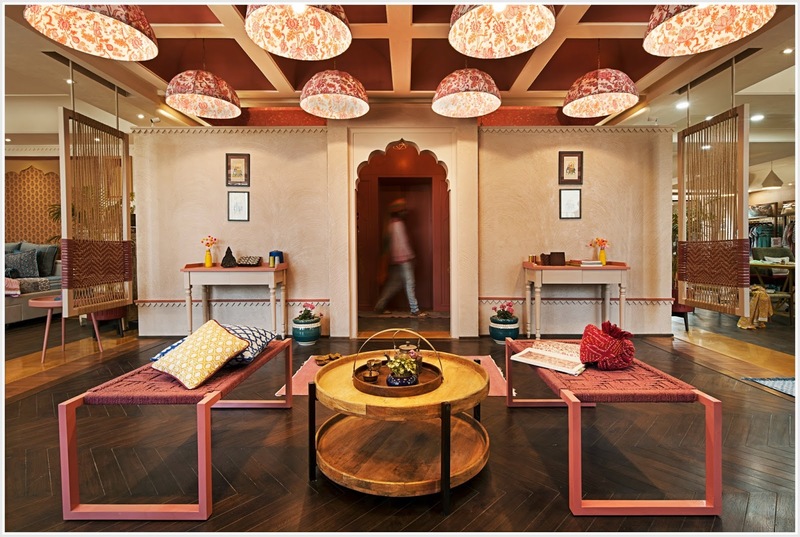 Each dome is fitted with a custom made fabric light fixture brightening up the space with a welcoming glow. 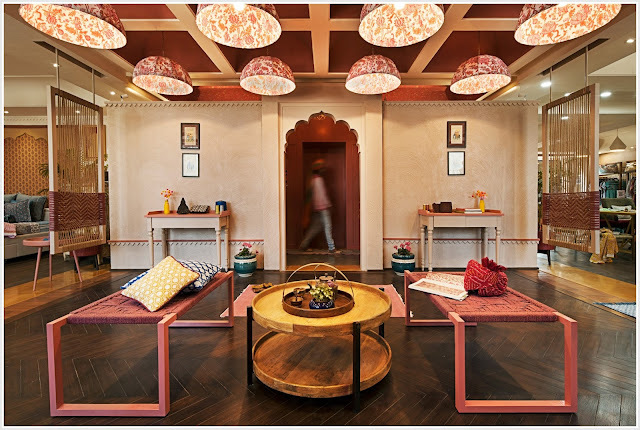 Once through the doorway, the hand crafted wooden floor, earthy tone of the village inspired ‘Lipai’ (mud plastered wall) and a wide display unit with a movable assortment of the hand blocks talks of the teams effort to make a cultural point at every step of the way. The lounging area facing the fountain, addresses both needs - recreation for the buyers as well as a place to congregate and discuss business. Furnishing the space is a set of in-house designed sofa and coffee table. The rectangular table with intricate bone inlay work was sourced from Jodhpur and adds more visual drama. As for the fountain spouts, they are carved out of Jaisalmer yellow stone and Blue lapis stone. Birds sculpted from fiber and clay add life to it (look close, you'll see it). 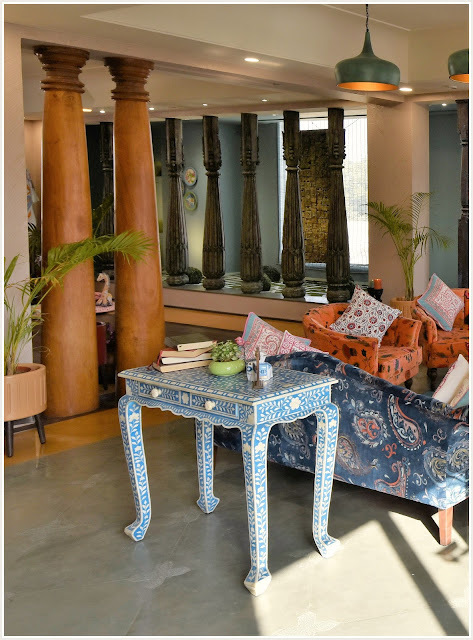 A set of twelve antique columns sourced from Jodhpur, of varying styles placed over the stretch of the Mughal inspired landscaped area & fountain, appeal to the panoramic vision of the viewer. All eight chairs of the dining area are custom made and hand woven by the skilled local weavers based on the product design provided by VB Design Studio. However the icing on the cake is the ‘shamiyana’ ceiling in the dining room, making the dining experience a majestic affair! View of the dining and lounging area from a different angle. Since, there are so many innovative and unorthodox design elements implemented in this project, I was more than interested in learning about the thought process and challenges that the team encountered in executing this project, "The 3,100 sq ft open space had abundance of sunlight and huge potential. It came to us as a blank canvas which called to bring out wildness of our imagination and think from a different and deeper perspective this time. After a series of day and night brainstorming, research, visiting villages, meeting craftsmen, learning about the methods like Arayash (fresco painting), lipai (mud like plastered walls), traditional khaat weaving, and so forth, we presented an entirely new experience to our client. The space lacked the palatial proportions so the design was at the risk of becoming obtuse. Also, there was a time, when we started playing with so many colors that it became difficult to find a symphony amidst them. But with deliberation, forethought, artists’ and client’s support, trial and error and experimentation with aesthetics, we were able to achieve the state of the art sophistication possessed by the royal spaces of Rajasthan." 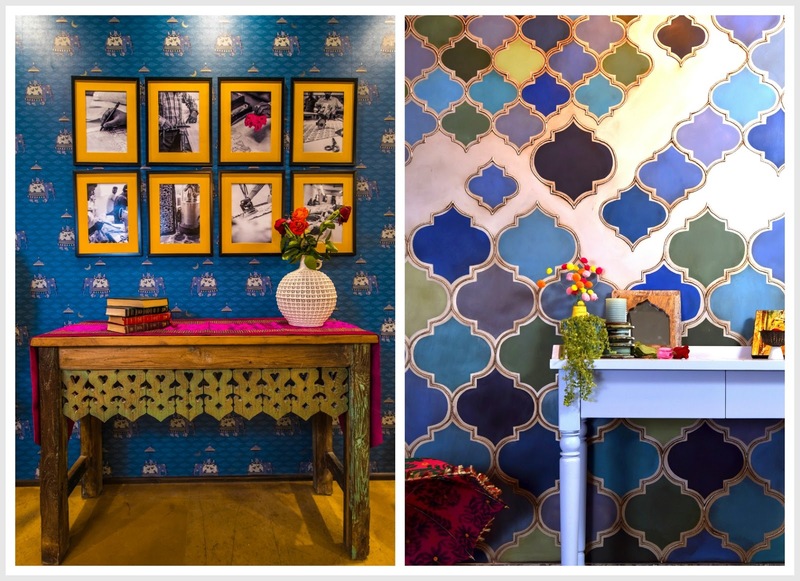 VB Design team went all out to try and incorporate different wall treatments to keep the interiors looking fresh and interesting. The image to the right shows the inclusion of Indechine Promenade Wallpaper from Good Earth. This acts as the perfect backdrop for a collection of photographs from the client’s factory that are a token of gratitude to the workers and their skill. (Love how the plain white matting has been switched for a sunflower hue to make a bold statement!) To the left of the collage is another wonderful wall treatment. This is the result of traditional ‘Arayash’ work that was done by master craftsmen. The display area on the left is the biggest that stretches the full width of the space. 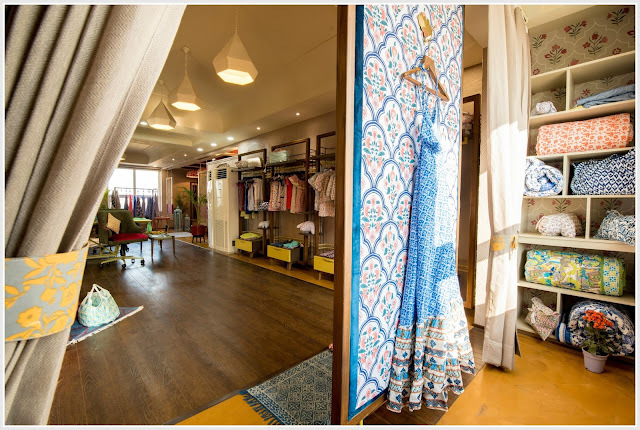 Display units with apparels stand close to the longer walls with changing rooms and storage strategically placed at the far end. Mockups for the Bedroom and the Kiddos area are on display between the Entrance foyer and the landscape area. 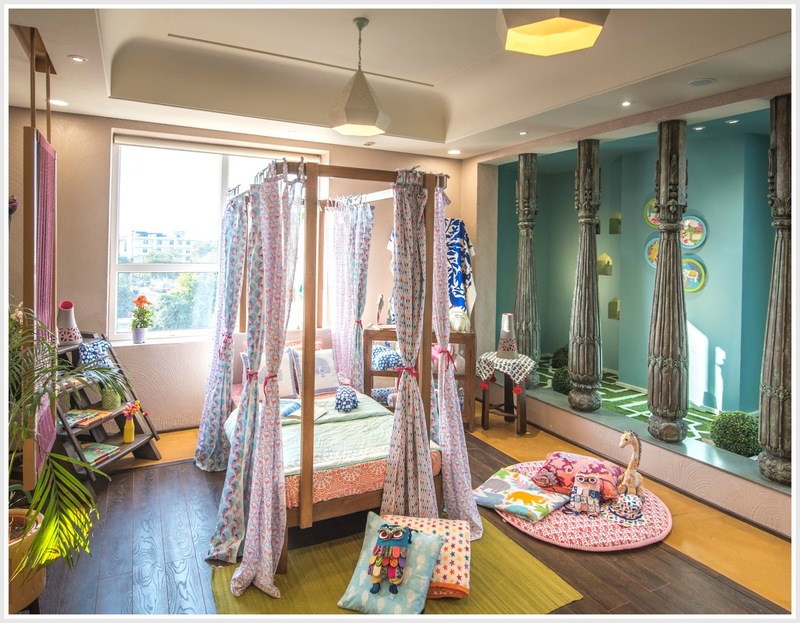 Softer hues dominate the kid's area with the client's product's being stylishly displayed without competing with the interiors. 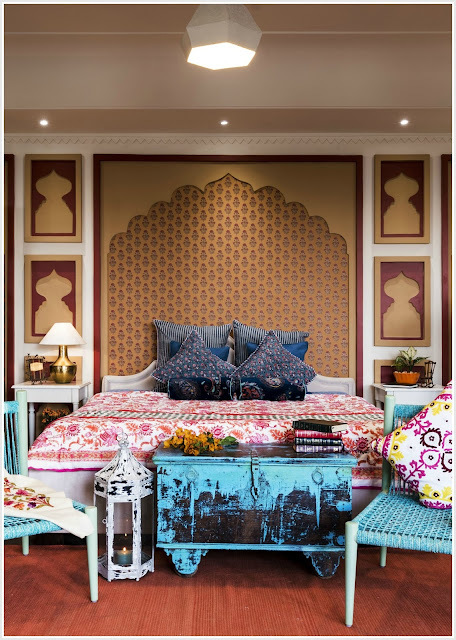 The wall behind the bedroom mock-up is an interpretation of the decorative walls and facades of the many palaces that dot the historic city of Jaipur. "~ A SPACE SHOULD BE THE REFLECTION OF THE INHABITANT. LISTENING AND OBSERVING THE PATRONS CAREFULLY TAKES YOU A LONG WAY. ~ A DESIGN THAT EVOKES HAPPINESS AND UPLIFTMENT IN THOUGHTS IS A SUCCESSFUL DESIGN. ~ WE DON’T BELIEVE IN FOLLOWING TRENDS BLINDLY, WE AIM FOR SOULFUL AND TIMELESS." More Stunning displays from Riwaayat!!! A close up of some of the custom pieces that were designed unique to the client. My absolute favorite being the woven chairs. VB Design Studio undertakes a wide spectrum of work ranging from Architecture, Interior Design, Product Design, Art Consultancy (in collaboration with Sunividh Art to provide customized solutions & creative consultancy on various art forms, sculptures, paintings and artifacts), Project Management Consultancy and Turnkey Projects. The company currently takes on onsite projects all across the country. For professional design advice and project collaborations, please email VB Design Studio team at info@vbds.in or call them at +91 141 272 9345/ +91 99291 08501 . You could also connect with them at their website, Facebook, Instagram and other social media handles on their page. 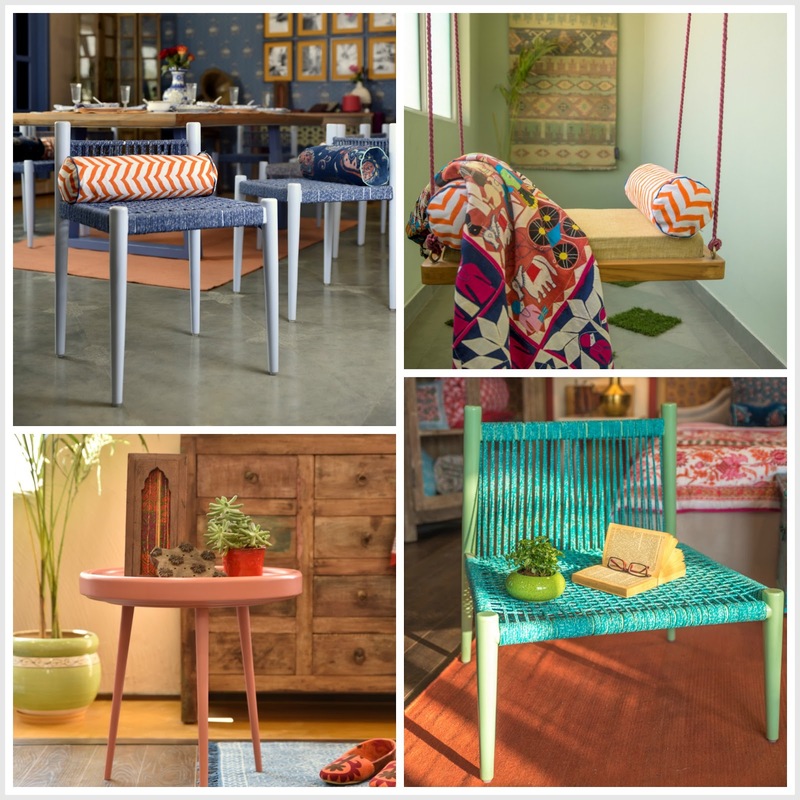 They are also on Houzz, do check them out! Thank you for visiting The East Coast Desi. I'd love to hear from you. Hello! 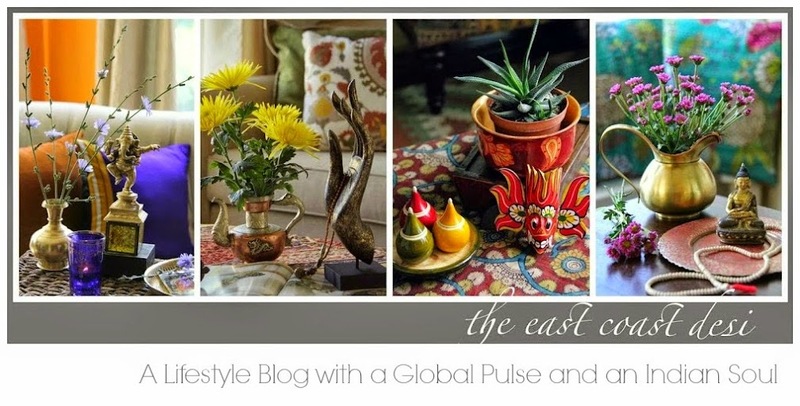 I'm Sruthi - a mother, wife, financial consultant, self-taught painter, small business owner, photographer, ever willing traveler, enjoy playing décor stylist and interior decorator when called upon to do so and a fervent blogger at “The East Coast Desi”. 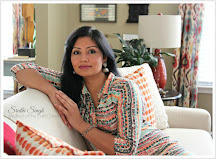 Follow Sruthi's board My Home My Style on Pinterest. COPYRIGHT © 2013-2015, THE EAST COAST DESI. ALL RIGHTS RESERVED. WE DO NOT PERMIT THE RE-POSTING OF OUR POSTS IN THEIR ENTIRETY. THE IMAGES FROM THIS WEBSITE MAY NOT BE USED FOR COMMERCIAL PURPOSES. SHOULD YOU WISH TO USE MY PHOTOS FOR NON-COMMERCIAL PURPOSES, PLEASE WRITE TO ME AND AFTER OBTAINING WRITTEN APPROVAL, CREDIT THE IMAGES WITH MY NAME AND LINK BACK TO THE ORIGINAL POST.